Good teams win games, but great teams can bounce back from a tough loss, and I’ll speak for the entire Crazies community by saying we can file last week’s game in Columbus under the “tough loss” category. Taking 20-point defeats is not something that the Duke Blue Devils are used to, but luckily for us, Colorado State is coming to town tonight. We can take away many negatives and a few positives away from the Ohio State game, some of which I discussed in my post yesterday. But there is one thing I’m sure we can all agree on—in order to get back to form and elevate itself to the next level, this Duke team needs a change. Luckily for us, the guy calling the shots for this team knows just a few things about basketball. Although he has not found himself in this situation many times throughout his illustrious career, Coach K has a knack for responding to a blowout loss with an adjustment that alters the identity of the team, and when Coach K responds, the team responds as well. Let’s take a look back to some similar situations Duke teams have found itself in over the last few years to examine the adjustments we might see tonight against Colorado State. What Went Wrong: In a word…everything. Duke couldn’t throw a shot into the ocean during this game, shooting a miserable 30.8% from the field. Kyle Singler, Nolan Smith, and Jon Scheyer, who would eventually lead the Blue Devils to a national championship the next season, shot a combined 4-23. Meanwhile, Duke had no answer for Clemson’s Trevor Booker, who shot 8-for-10 from the floor en route to 21 points and eight rebounds. How Coach K Adjusted: Finding themselves in a similar situation as this year’s Blue Devils, with no true point guard to speak of, Greg Paulus assumed the role in Duke’s next game, starting in favor of Nolan Smith. Krzyzewski also used a significantly smaller rotation in this game, with only six Blue Devils playing more than 7 minutes in the contest. The Result: Despite going in down 32-19 at the half, Duke came back to win an overtime thriller at Cameron by a score of 78-75. Miami’s Jack McClinton scored a game-high 34 points in a herculean effort, while Paulus added 18 points in his first game at point guard. Duke’s shooting woes continued, however, as Kyle Singler scored 17 points but at the expense of a 5-for-23 shooting effort. Overall, Duke would go on to lose its next two games following Miami, but was able to finish 8-1 down the stretch en route to an ACC Tournament championship. The team would fall earn a #2 seed in the NCAA Tournament and fall in the Sweet 16 to #3 seed Villanova. What Went Wrong: Georgetown shot an obscene 71.7% from the field as Lance Thomas and Miles Plumlee’s shoddy interior defense allowed the Hoyas’ Greg Monroe, Chris Wright, and Austin Freeman to attack the rim and score at will. 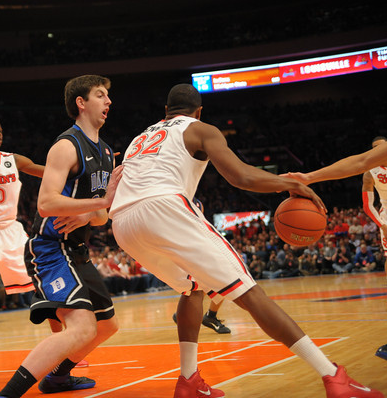 Duke once again relied too heavily on its outside shooting and was only able to muster 9-of-29 from three-point land. President Obama watched on at the Verizon Center as Georgetown pushed its lead to 23 late in the second half, before a mini Duke run allowed the final score to look slightly more respectable. How Coach K Adjusted: Brian Zoubek, who played only two minutes against Georgetown, saw his playing time increase to 13 minutes in Duke’s next contest, an 86-67 victory over a ranked Georgia Tech squad. Zoubek continued to put in quality minutes in the team’s ensuing games and replaced Miles Plumlee in the starting lineup three games later, when he played the best game of his Duke career with 16 points and 17 rebounds in a 77-56 rout of Maryland. The Result: We all know how this story ended, as Zoubek started for the rest of the season, playing a crucial role as Duke went on to win 18 of its final 19 games en route to its fourth national championship. What Went Wrong: Playing at Madison Square Garden, the Red Storm certainly had a home court advantage and didn’t waste any time, jumping on the Blue Devils early and often. As the lead ballooned to 21 points at the half, the Johnnies continued to coast, not allowing Duke to cut the lead to less than 13 for the rest of the game. The Blue Devils were too reliant on their three-point shooting early in the game, and fell behind as the shots were not falling. Faced with a large deficit, Duke had to rely on long range shooting in the second half in hopes of a comeback, but its struggles continued from beyond the arc, knocking down just 5-of-26 three-point attempts on the afternoon. How Coach K Adjusted: Tyler Thornton replaced Seth Curry in Duke’s next game at Maryland as the Blue Devils sought to shift their focus from three-point shooting to defense and efficiency in their half-court sets. The Result: Duke held firm control over an inexperienced Maryland team throughout the contest, coasting to an 80-62 win. Kyle Singler and Nolan Smith led the team with 22 and 21 points, respectively, while Mason Plumlee added an impressive 12 points and 11 rebounds on 6-of-7 shooting. Duke would go on to post an 11-2 record to close out the season with yet another ACC Tournament title before falling in the Sweet 16 to Arizona. And here we are. Following a performance in Columbus that couldn’t even qualify as subpar, Duke faces yet another critical juncture in its season. If there is any time for new life to be breathed into this Blue Devils team, it is now. Despite minor tests against Temple, Florida State, and upstart Virginia over the ensuing weeks, Duke certainly won’t be considered an underdog in any game it plays before its February 8th matchup with “the-team-who-must-not-be-named” in Chapel Hill. Although following last week’s beatdown at the hands of the Buckeyes this year’s matchup at Carolina looks especially daunting, if this team can make the necessary adjustments and hit its stride, we could be looking at one of the games of the year in college basketball. The only question now is, what will be Krzyzewski’s adjustment this time around? It almost certainly will include some sort of a change in tomorrow night’s starting lineup, though it is not particularly clear as to who will be inserted. The most likely to be pulled from the starting lineup following last week’s debacle appear to be Ryan Kelly and Andre Dawkins, both of whom played quite poorly and sat nearly the entire second half. Although Kelly has not always been reliable defensively (which is where Duke clearly got burned against Ohio State), I think the clear choice is to pull Dawkins. If you’ve been keeping up with our statistical analyses using advanced metrics, you’ll see that despite his weak showing last week, Kelly has been the most consistent offensive weapon on this year’s Duke team. Who is inserted into the starting lineup is a bit more up in the air, however. What Duke is lacking right now is the presence of a big wing player who can defend on the perimeter. As of now the only person on the roster that fits that role is Michael Gbinije, who saw more minutes against Ohio State than he had all year and put forth a decent effort. But I still question whether at this point in the year Gbinije is ready to take on a starting role, so I would say the more likely option is to see Quinn Cook or Tyler Thornton tomorrow night. Putting a true point guard out there will provide more stability on offense, and Thornton’s defense would surely be appreciated to make sure nobody can ever replicate Aaron Craft’s performance from last week again. If I were a betting man, I would say Thornton starts in place of Dawkins, but I would not be surprised to see any of these three in the starting lineup tonight. Luckily for the Blue Devils, Colorado State does not pose a particularly tough test, so it should have plenty of opportunities to try different combinations of players and work to improve on some of the weaknesses from last week. Let’s hope history repeats itself and the adjustments pay off. Stay Crazie, my friends.